What are the Different Components of a Campaign? Learn more about the different components of a campaign such as a Stripe, Structure and Blocks. The blocks are the basic components of an email such as an image, text, button, spacer, video, social networks, banner, menu or HTML code. A group of blocks becomes a container. The product information or blog articles component that you will create in your campaigns are most of the time a container. It is a group of blocks inside a container. This is usually what is being saved in the library so you can use these containers in other campaigns. The container makes the arrangement in the structure (ie. columns). A structure is the mutual arrangements of containers in the email (ie. have two columns of containers). It can have a different background than the stripe and the containers. 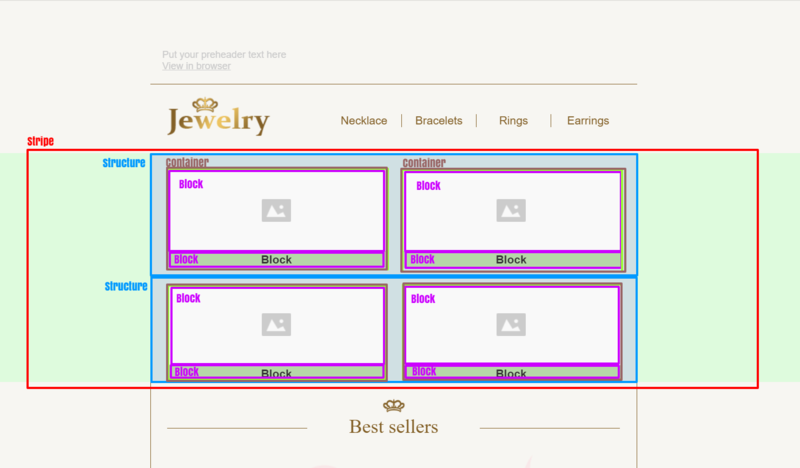 The width of the structure usually is the same as the Email Width (600 pixels recommended). Multiple structures can be inside a stripe. An email campaign is divided into stripes. A stripe is the main component of the email. It allows you to set the background beyond the boundaries of the email, on the content, on the boundaries of the object. It has a full width of an email and can be composed of multiple structures.